Are you so tired of winter’s snow and cold that you have decided that winter really is for the birds? Watching our feathered friends at the bird feeder is one way to make the short winter days seem even a bit shorter and there are a few ways that you can expand that joy of bird watching in the winter months. Read on! If cabin fever hasn’t set into your home, there are many Wisconsinites that would like to know your secret. It’s the time of year when many have stopped watching the weather forecast knowing that one thing is certain. It’s going to be cold. The excitement of freshly fallen snow has disappeared. Winter sports have become commonplace. So, here is the lull of February and March – the never-ending winter months after the holidays have passed. What can you do to reinvigorate the fires under your bums? When I start feeling the glum of winter I entertain contradictory thoughts. Initially, that gives me visions of flowered meadows, trees in full foliage and lawns ready to be mowed. Quickly, reality bites me with a nip of winters chill. How can I fuse the ideas together? The birds of the winter months bring different qualities than summer birding. While witnessing the fortitude of the birds of winter against the elements, one can seemingly escape from their own reality. 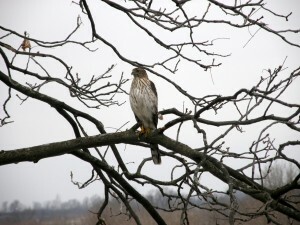 Most can get views of common birds near their home while a few with natural landscape acreage are able to witness the activities of more unique birds. To get access to unique and stunning birds in their natural environment, visiting a Madison Audubon Society Sanctuary is the best bet. Not only can you get some great bird watching in, you can support a great cause and benefit from their efforts. Faville Grove and Goose Pond Sanctuary are within short driving distances of the Speckled Hen Inn and are worth getting off the couch for. The two sanctuaries, each with their distinctive environments, are home to common birds like the Black-Capped Chickadee, snow bunting and the Lapland Longspur. If the stars align during your visit, you’ll be lucky enough to see some of the more rare fowl like the Snowy Owl, Short Eared Owl or the Tundra Swan. Even if you don’t get to see some of the unusual birds, it’s one more adventure, another check off the bucket list, one that staves off the ever-looming cabin fever. Thanks to the spring fed stream on the property here at the Speckled Hen Inn, we’ve seen some noteworthy birding activities as well. As usual, the Cardinals continuously grace the property contrasting their scarlet color against the monotonous brown and white winter landscape. The Downy and Hairy Woodpeckers flirt with urban life, flittering among the trees yet maintaining a safe distance. The wild turkeys and their families continue to grace the pasture as they enjoy gleaning the leftover sheep’s snacks and we have our own family of hawks and owls that have decided this is a safe place to call home. Book a stay and enjoy it firsthand! As the temperatures wane and spring peeks through, so will the beautiful colors and markings of creepers and waxwings that make our property a stopover on their way to their summer home. You too welcome to visit for a night or stay for a week to enjoy the simple pleasures nature offers. It’ll make winter more than bearable.